We would like to set up business relationship with your company. Yantai Sanli Machinery Co., LTD is a professional Powder coating Product Line manufacturer aiming at providing reliable and affordable equipments. Till now, we have developed a wide range of Product Line including 200tons, 300tons, 500tons, 600tons, 1000tons, 1500tons and 2000tons. 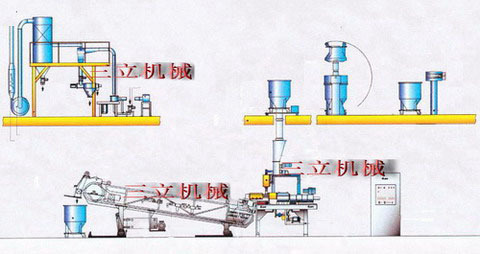 Among those models, the Bonding Metal Powder Coating Mixer and UV Powder Coating Line has filled the blank in China. Also, the relevant laboratory Product Line is characteristic of high quality. As a professional manufacturer with 12 years' experience, we not only supply you with quality equipments, fast delivery and technical assistance promptly, also our technique center response quickly to any special request if your technical improvement suggestion sound practical and reasonable. Furthermore, we are dedicating ourselves into developing new models and keep an eye on the market demands, According to customer's requirements, we would like to carry on the omni-directional service such as the technology process design, the model select, the automation formulation, installation and debugging, the prescription formulation, product line testing, as well as technical training. Fore more information, PLS link our website. or send email to ellaben#126.cm(# for less spam). Besides, we also pay more attention to promote our equipment by advertising on the professional website, to make more customers acquaintance with our equipment. We are confident, our prices can't be beat. Every year, about 600 product lines are needed in Chinese market, during which 40% (say 240 lines) is supplied by Sanli Company. What we advocate is quality to win, but not the low-currency dumping, which helps maintain a stable increase of client group. So our clients always rest assured our quality is guaranteed. We appreciate your further response.